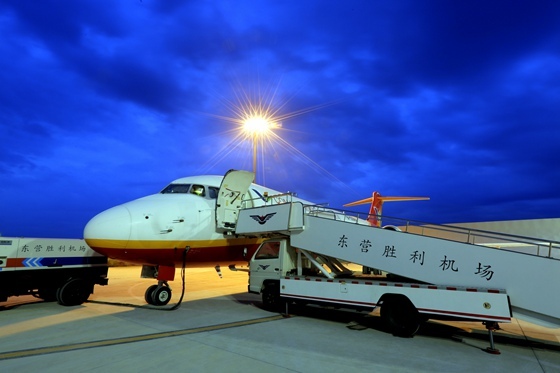 BDS applied to China-made civil aircraft and flight tested successfully for the first time__Commercial Aircraft Corporation of China, Ltd.
BDS was applied to China-made civil aircraft and flight tested successfully for the first time. 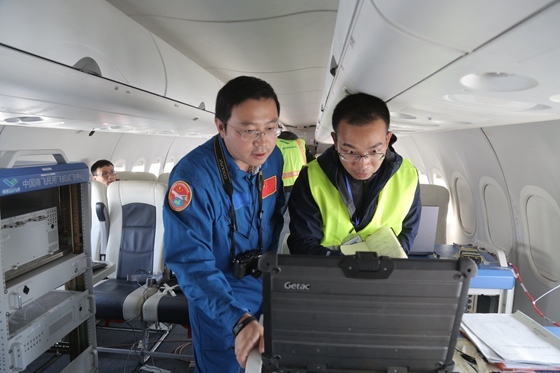 China's self-made BeiDou Navigation Satellite System (BDS) was applied to ARJ21-700 AC103, a regional jet independently designed and manufactured by China, and flight tested for the first time from October 10th to 14th, 2017 at Dongying, Shandong province, and the flight test was a complete success. Mr. Zhang Ruiqing, Deputy Director of Air Traffic Control Office of Civil Aviation Administration of China (CAAC), Mr. Wu Guanghui, Vice President of Commercial Aircraft Corporation of China, Ltd. (COMAC), Mr. Shen Changyou, Secretary of the CPC Dongying Municipal Committee, and Mr. Fang Jiancheng, Vice President of Beihang University, directed the flight test on site on October 14th, 2017. This test is carried out based on ARJ21-700 platform and in accordance with relevant international civil aviation standards and relevant CAAC technical standards, which successfully verifies the function and performance of airborne BDS receiver, the performance of achieving Category I precision approach depending on BeiDou Ground Based Augmentation System, and the short message function of BDS by flight test. The test results show that the performance of relevant home-made systems has reached the same level as foreign systems, wherein the transient and rapid positioning index is in leading position in the world. This flight test realizes the integration of four domestic systems for the first time, that is to integrate the domestic navigation satellite system, the domestic navigation satellite ground based augmentation system and the domestic airborne navigation system with the domestic civil aircraft platform, which acquires a large amount of experimental data for the follow-up international civil aviation standardization, application, promotion, testing and authentication of BDS. This is the first time for BDS to be applied and tested in civil aviation field and is also the first time for a domestic civil aircraft to use a domestic navigation system, which marks a milestone in the integrated development of the two key projects bearing on the national economy and the people's livelihood. Therefore, the application of domestic navigation satellite system in domestic civil aircraft is officially started and a new era of domestic civil aircraft navigation system is opened up. 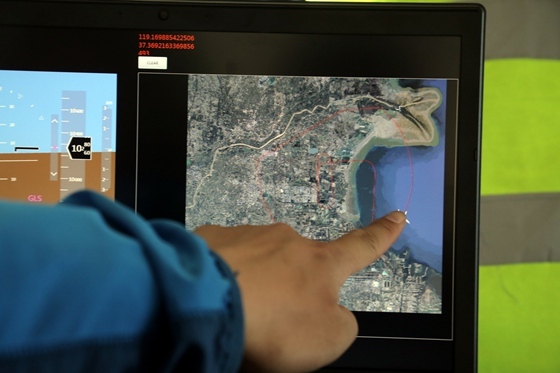 The verification flight test for application of BDS in civil aircraft was directed by CAAC and China Satellite Navigation Office, carried out based on the Key Project of BeiDou Navigation Satellite System and the Key Project of Large Aircraft, and strongly supported by the units concerned such as relevant ministries and commissions of the state and local governments of Dongying. 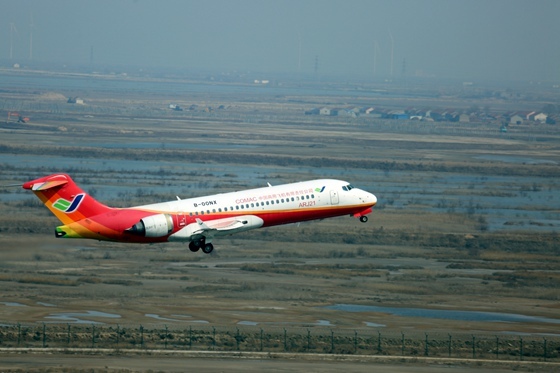 The flight test program is led by Beijing Aeronautical Science and Technology Research Institute (BASTRI) of COMAC, participated by the Flight Test Center, Shanghai Aircraft Design and Research Institute (SADRI) and Shanghai Aircraft Manufacturing Co., Ltd., and jointly studied by Beihang University, Tianjin 712 Communication & Broadcasting (TCB), Hwa Create Technology Corporation, Ltd. and other supplier units. In the progress of planning the development of trunk aircraft and regional aircraft as a whole, COMAC will bear and realize the missions and objectives of "applying BeiDou in civil aircraft", keep tracking the development of BDS, actively utilize its advantages to advance the research and application of BeiDou flight test program through a great deal of prestudy, accelerate the application of BDS in the field of civil aviation transportation, and promote the leap-forward development of China from a big civil aviation country to a powerful civil aviation country. ARJ21-700 AC103 undertook the flight test. BeiDou satellite equipment completed relevant flight test subjects. Test personnel boarded the aircraft for monitoring. The flight test was successfully completed.